Carrot is Daucus carota sativus of the parsley family. Carrot is a vegetable grown for its edible root. Raw carrots are eaten in salads and are mixed with some viands. Carrot contain carotene, a chemical that is converted into vitamin A by the body, it helps prevent night blindness. Carrot can enhance the quality of breast milk. 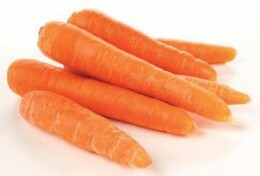 Carrot can improve the appearance of the skin, hair and nails. When taken daily it can lower cholesterol and blood pressure. Raw contain beta-carotene, a strong antioxidant that can prevent cancer. Carrot juice when taken everyday prevent bodily infections and is claimed to be valuable for the adrenal glands (the small endocrine glands situated above the kidneys). Carrot can help improve eyesight. Carrot can help increase menstrual flow. Carrots can regulate blood sugar. Carrot can promote colon health, because carrot is rich in fiber. Vitamin B; Thiamine B: .06 mg.